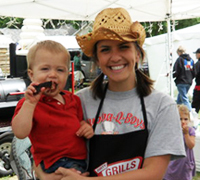 What started out as backyard BBQ fun for Josh and Kristy in 2008, grew into BBQ competitions and packaging of an award-winning BBQ rub. The couple has three kids (11, 9 and 6) who love to cook and of course, love BBQ! They enjoy grilling out on weeknights and hosting BBQ events on the weekends with family and friends. 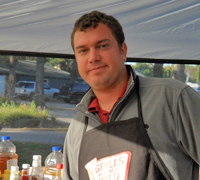 Josh has always had a knack with grilling but quickly became addicted to smoking meat once he began. His first smoker was an Oklahoma Joe’s only big enough to smoke ribs and pork shoulder. He is now the proud owner of a custom made, pull-behind smoker named Rosie (thanks to his daughter, Addy). From set up to tear down Josh is there through it all. He concocted his own meat rub, steps and procedure which has won the team4th in chicken,7th in ribs and9th in brisket in a variety of contests. Kristy and Josh’s children: Addyson, 7 Aiden 4 and Avery 2, attend every contest. Between wrangling kids and rubbing down the meat, she is the brains behind the selection and contest preparation. With 1/3 of the judging being appearance, it’s important that all meats are chosen and placed perfectly in the containers. Kristy has a keen sense of taste and appearance and she knows what to look for with each meat. 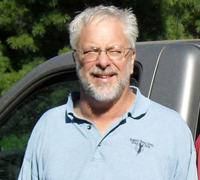 Don is the founder of the initial Bubba-Q-Boys. He and his buddy bought their first Backwoods smoker in 2004 and named him “Bubba”. He introduced Josh into BBQ in 2006. Since then he’s been competing with Josh and Kristy in competitions in Missouri and Oklahoma. Don specializes in ribs with his own special rub and sauce.